Consider Your Options is our plain language guide to compensation in stock and options. It highlights the opportunities — and pitfalls — in handling these items, providing complete, authoritative information on everything from the section 83b election to the dreaded alternative minimum tax (AMT). This edition. The 2019 edition of this perennial best-seller (the ninth edition) updates for developments through 2018 and tells how changes made by the Tax Cuts and Jobs Act may affect your strategy. Amazon reviews. Most recent tally is 53 reviews, average 4.5 stars. This book is intended for all readers. It’s written in plain language for those who may be new to investing or know little about taxes, but covers relevant rules and strategies in enough detail to be suitable for investment advisors and tax professionals. For years it has been required reading for those undertaking the course of study offered by the Certified Equity Professional Institute. Financial advisors and other professionals who do a substantial amount of work in this area may wish to consider our other book on the subject, Equity Compensation Strategies. 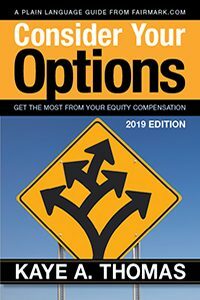 Consider Your Options explains tax rules and strategies that will help you get the most from the stock and options you earn as an employee or executive. An overview of the subject; working with (or without) an advisor; introductory information about stock prices and investment risk. Terminology, tax rules, and planning considerations for restricted stock awards. Terminology and basic economics of stock options; determining when an option is ripe for harvesting. Tax rules for these kinds of options; examination of a strategy to secure profits in the form of capital gain. Rules for ISOs under both regular income tax and alternative minimum tax; a review of strategies, both good and bad, often recommended for this type of option. Special tax rules that apply in connection with this method of exercising nonqualified stock options or ISOs. Details on the rules for vesting, including the section 83b election and “early exercise” stock option plans. An explanation of how these plans work, and the applicable tax rules and strategies. Various other topics, including estimated tax payments, estate planning issues and net investment income tax. The 2019 edition is the ninth edition of this book, reflecting legal authorities through 2018. Changes from the previous edition include amendments made by the Tax Cuts and Jobs Act, and discussion of how this tax law may affect strategies.